Many farmers in the Palouse region of northern Idaho have remarked on the unusually large amount of spring rain falling over their fields in recent years. For dryland farmers in the Palouse, a wetter spring means wetter fields – and the longer it will take to plant. In general, a warmer atmosphere is capable of holding more water  leading to the potential for heavier precipitation events . These more extreme storms will result in more water on farmer’s fields in a shorter amount of time. Soils only have limited space to hold water. If they don’t have time to absorb all of the water, erosion and/or runoff will occur. Agriculture depends on timely planting. Delayed plant dates do not ensure that a grower’s harvest will make it to the market early enough to get a fair price. Furthermore, if the planting date is pushed later into the summer, crops could face the reality of early fall frosts, resulting in crop damage and even loss . 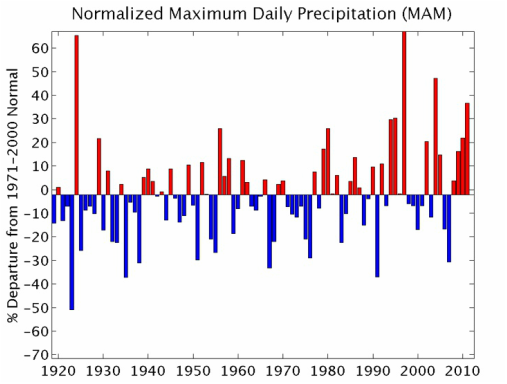 Precipitation indicator: intensity of the most extreme one- day precipitation event of the spring (MAM) in a given year rela- tive to the mean from 1971–2000 (normal) for 28 stations in Idaho. Unpredictable planting dates also affect how growers manage fertilizer application. Most farmers in Idaho apply fertilizer in the late fall or early spring. If heavy spring rains delay the timing of crop growth, fertilizer is left in the field to be potentially swept away as runoff (adding fertilizer to the water) or left concentrated in ponds, where it can be released as a heat-trapping gas (Nitrous Oxide) through the process of denitrification [1,2]. In addition to delayed planting dates and environmental consequences, heavy spring rains are the driving force of soil erosion . Erosion is most common on bare, un-vegetated surfaces, like those found before crops are planted in the spring . Across Idaho, erosion has resulted in topsoil loss, leaving behind nutrient poor bedrock or clayey soils . While many farmers have adopted practices that work to conserve soil, some still have not and now face the consequences of a trend toward extreme spring precipitation events across Idaho . Historical precipitation records across the state were used to verify farmers' observations. An “extreme event” is defined as the largest daily precipitation accumulation during March 15 thru Mary 15. We looked at 28 climate stations across Idaho available from the United States Climatological Network, all of which have recorded daily precipitation records (some going back to 1895). We calculated the difference between the highest amount of rain for any day during the spring relative to all years (Figure 2). Our results suggest that the intensity of the biggest rainfall event of the season has increased with most of the largest events since 1990 (Figure 2). This increase may force Idaho growers to face the impacts of lower yields and lower crop quality. These impacts are the result of delayed planting dates, increased greenhouse gas emissions, and more runoff and erosion – all of which are partially caused by wet soil that make it difficult for farmers to work their fields and manage the land.